Fire blight is a major production constrain in apple production, especially in areas with high humidity such as Alabama and the southeastern U.S. Early trial work in apples identified an apple rootstock, B.9, which demonstrated little to no fire blight infection of the scion canopy in field plots. Researchers at Cornell University used this site and field observations to launch more in-depth research, demonstrating and confirming the effects of B.9 in suppressing disease pathogens. Figure 1. Size-controlling Fire blight resistant apple rootstock trial established at the Chilton REC, Clanton, AL. A series of fire blight resistant size-controlling rootstocks have been developed, known as Geneva series. Most recently, fire blight resistant Vineland series have been developed in Ontario that also provide tree size control. 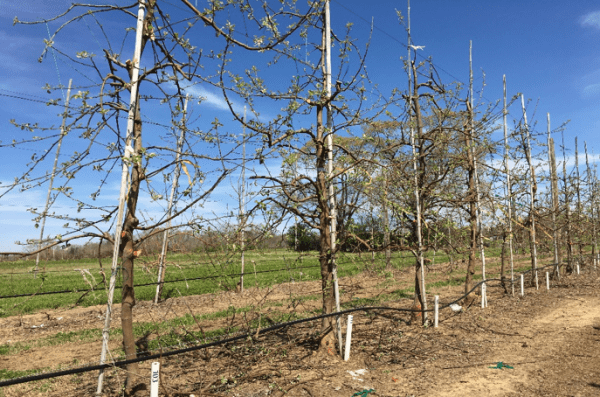 Trees of the low chill ‘Aztec Fuji’ scion cultivar grafted on 14 newly developed size-controlling fire blight resistant apple rootstocks were planted at the Chilton Research and Extension Center in Clanton (Figure 1). 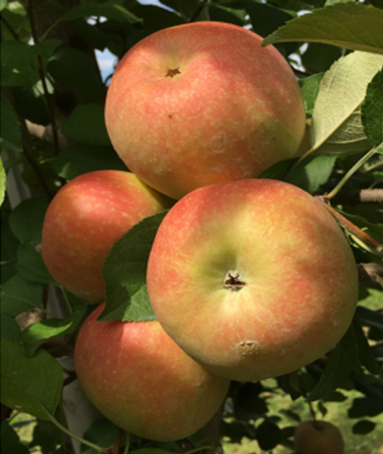 This was done to determine the rootstock effects on tree vigor, total yield, yield efficiency, and fruit quality of ‘Aztec Fuji’ apple in Alabama conditions. 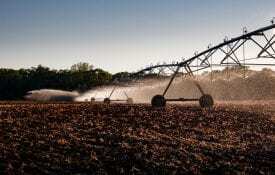 Planting distance is 5 ft X 13 ft, which equates to a total number of 672 trees/acre. 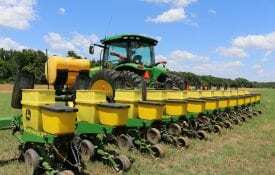 Rootstocks tested include B.10, G.11, G.202, G.214, G.30, G.41, G.935, G.969, M.26 EMLA, M.9 T337, V.1 (USA Only), V.5, V.6, and V.7. 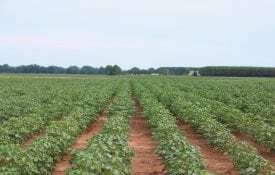 Our results suggest ‘G.214’, “G.935’, and ‘G.41’ are promising rootstocks for Alabama conditions based on yield efficiency during the study period (Table 1). Trees grafted on ‘G.202’ produced the sweetest fruit with the most intense skin blush color (Fig. 2). The Vineland series of rootstocks ‘V.5’, ‘V.6’, and ‘V.7’ produced relatively high total yield, but were the most vigorously growing rootstocks in the present study, and may not be a good choice of size-controlling rootstocks for a high density apple orchard system in Alabama. 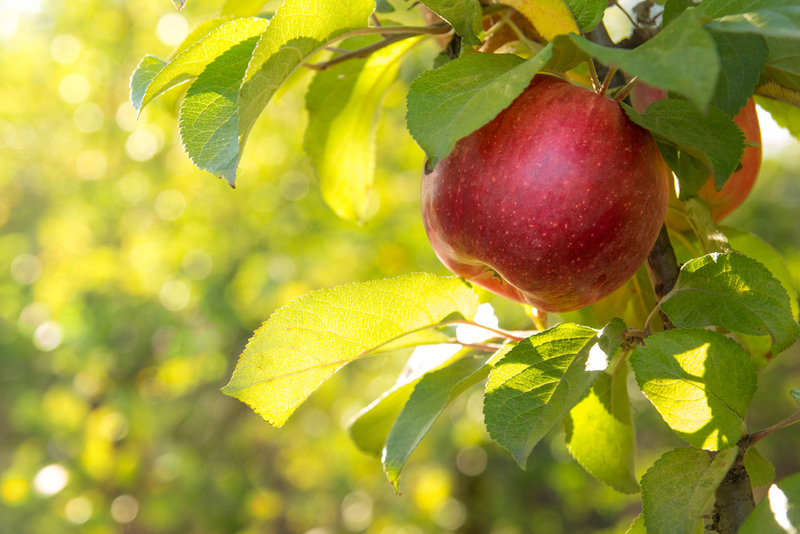 The outcomes of this research are expected to help enhance economic viability of Alabama apple farms through improved selection of rootstocks leading to greater production efficiency and improved fruit quality. Orchards may use labor and land more efficiently leading to a faster return on investment with fewer tree losses.